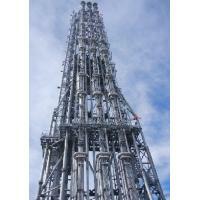 Design, supply, site supervision on erection, commissioning, training. Air assistant, Air force draft, sonic, etc. Flare System is to handle the discharged combustible gas under the conditions of normal operation, start-up, shut-down and emergencies, which ensure the gas to be flared out instantaneously, safely and reliably and to meet the demand of environmental protection. 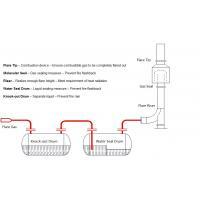 Flare System is a kind of safety equipment comprised of pipeline, knock out device, fire retardant equipment, flare burner, ignition system, flare riser and other components. * Based on the vent gas media’s physical parameters (mainly for toxicity of the vent gas media), discharge pressure, flow rate and so on, the flare shall be divided into two categories – elevated flare and ground flare. * The elevated flare, based on the support way, shall be divided into self-supported flare, inhaul supported flare and derrick supported flare. 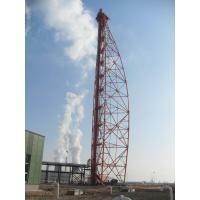 The derrick supported flare, based on types of the riser to be fixed, shall be divided into fixed derrick supported flare, demountable derrick supported flare. * The ground flare, based on vent gas treatment capacity, shall be divided into enclosed ground flare and open ground flare. * Based on structure of flare burner, the flare shall be divided into steam-assist flare, forced draft assist flare, defused flare, LHV flare, multi-hole collision flare, sonic flare, etc. ▽ Media attribute: The media which is no extremely harmful. ▽Industry: refinery, coal-chemical, LNG, off-shore, etc. ▽Application: The devices matching up multi sets of flare system can’t be “same-time start-up & shut-down”, need to reserve extra flare system for expansion and save land investment. ▽Location: applicable for cold area. Elevated Flare System: The combustible gas is discharged from production equipment, flows into the battery limit of flare through vent pipe network, flows into the knock-out drum for separation of liquid drops probably contained in vent gas, flows into the water seal drum and breaks through the water seal, and then flows into the flare riser, goes through the molecular seal and finally is flared out by the burner. 7. Have professional & high efficient after-sale service system. Phase #1 - 10,000,000T/y Refinery Project: The flare system consists of HP flare (DN1600), LP flare (DN1600) and Sour gas flare (DN500), and a reservation for DN1600 flare riser. The height of flare system: 150m. 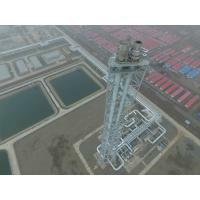 Phase #2 – 12,000,000T/y Refinery Project: Based on the reserved space of phase #1 for DN1600 flare riser and the optimized design of system, SMDERI took full advantage of “on-line assembly & system expansion” of the demountable common derrick flare to realize the reconstruction & expansion of phase #1 flare system and reach the target of multi-risers being set on a common derrick. For the best utilization of land, SMDERI provided his technical support so that the land investment was saved. The flare gas recovery system was equipped with a 20,000M3 Gas Holder, 2 units of 600,000M3 screw compressors and 2 units of 300,000M3 screw compressors.